Hello beauties! In my post on getting body confident, I mentioned that I purchased something called Glow Powder. Made by an Australian company called The Beauty Chef, they make natural and organic products that help support your skin from the inside. 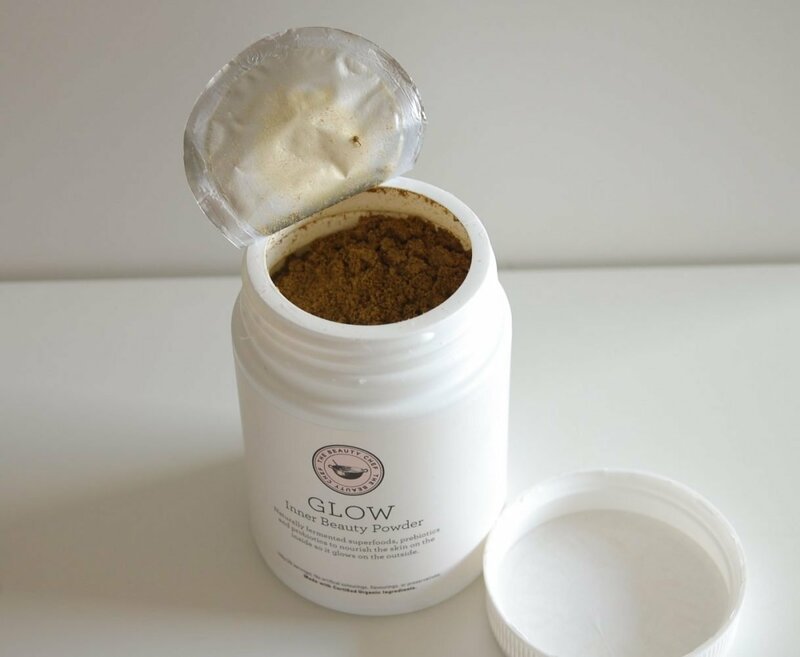 I purchased my Glow Powder at Selfridges and had a really informative conversaton with the rep. She explained that we don’t always get enough vitamins and minerals to support our body at it’s optimum level due to our fast paced lives. Our gut is an important organ and is now being referred to as our second brain. Yup it’s that important! The company believes that beauty begins in the belly and uses bio-fermentation to enhance the benefits of whole foods. Essentially what I understand is that, they create products to put the good bacteria back in your gut, which makes you feel better and your skin looks better. The powder is a dark green consistency and looks like dried mud. I know that doesn’t sound appetising but to be honest that’s about as bad as it gets, in terms of looks, smells and taste. It tastes a bit like blueberries when you add it to plain water. The rep said she was able to replace her ribena obsession with it and I understand why. There’s no yucky smell or taste. So yay! On the container it said to take one teaspoon a day and to keep refridgerated upon opening. For about a week I took a teaspoon of the powder with some juice, water or smoothies. I noticed straight away that my energy levels were a bit higher and that was A star in my book, but I did feel bloated. To combat this I tried taking it at night, at least an hour before bed, but what really did the trick was taking it every couple of days. I have been taking the glow powder for about 6 weeks now and my nails are a stronger. I’ve always had long nails that grew really quickly but then stress put a stop to that. My hair is thicker, something my hairdresser noticed when I did my hair three weeks ago. As for my skin, which is really why I started taking it in the first place, I would say it has helped with redness. It isn’t completely gone but I’ve seen a reduction and friends have commented on how my skin is ‘glowy’. Apart from the bloating, I’m pretty impressed with the product and the impact it has had on my skin. Have you tried Glow Powder? What do you think? Let me know in the comments below. As always, thank you for reading. Be sure to subscribe so you don’t miss a post.